Glioblastoma. Fibromuscular dysplasia. Auditory neuropathy. Subjects like these are not easy to explain, which is why hospitals and healthcare systems rely on patient stories to communicate what their organization has to offer. We looked at more than 30 hospitals’ and healthcare systems’ websites and social media content to better understand how storytelling is used in this industry. Nearly all institutions use patient success stories to “advocate” on the hospitals’ behalf. This type of storytelling is successful because it creates an advocacy-style of communication, rather than focusing on company-boasting advertising or marketing. It enables the viewer to identify with the patient, and in turn, create an emotional trust or bond with the organization (which is the goal of every company, no matter the industry). The majority of U.S. hospitals and healthcare systems are nonprofit institutions (about 80%) but still rely heavily on advertising and marketing to meet their business goals. Although the focus of the storytelling is on the patient and his/her journey back to good health, the ultimate aim is to highlight the institution as the hero. Patient storytelling can be viewed as advocacy for better health, but in the end, is still institutional PR. NorthShore University HealthSystem uses patient stories to highlight the type of care they offer. But not all storytelling is patient-centric (aka, advocacy-based, or, when the patient serves as an advocate of the hospital). Institutions use other storytellers to communicate to the public, in both video and print formats. Before directing the majority of efforts on the patient story, most healthcare institutions highlighted their physicians. The doctor profile is still a staple for most hospitals, but now their expertise is usually highlighted through a patient and getting them back to health. And sometimes, the patient doesn’t get better unfortunately, but still received the best possible care from an expert specialist, like the gripping story of Mike who was diagnosed with frontotemporal dementia by Dr. Brad Dickerson of Mass General Hospital. According to Mike’s widow, Dr. Dickerson was the best choice for Mike. Another avenue healthcare organizations use for storytelling are videos for patient education, such as the Cancer Centers of America’s Patient Stories. Healthcare organizations use a variety of types of media to communicate their advocacy storytelling. The most popular type is still the traditional print story—feature writing with accompanying photos. Nearly all hospitals have versions of these on their website, most repeated word-for-word content from printed materials, but some generated just for web content, like Mass General Hospital’s patient story page. 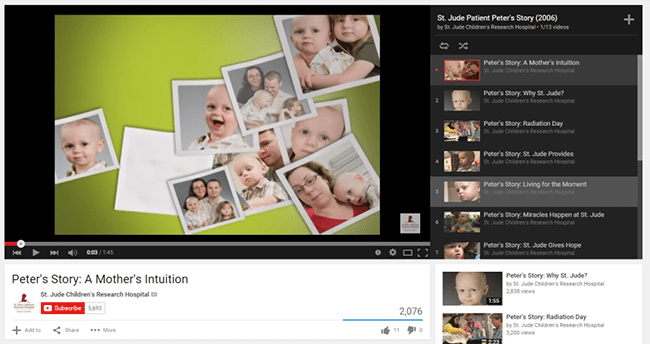 The growing trend of storytelling in healthcare is the first-person video profiles, often in a series of “patient journeys,” like Peter’s story from St. Jude’s Children Research Hospital. There are thirteen videos describing the journey of his illness and the road back to health. 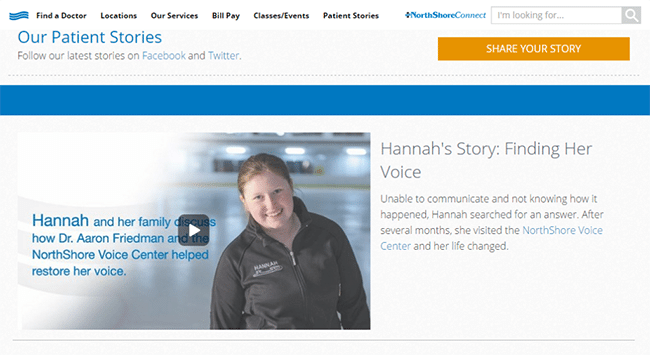 Oftentimes, the patient story is just depicted in one video, like Hannah’s story above. Others incorporate video and photos to tell the story, like Mike’s wife (also above). St. Jude’s uses a series of first-person patient narratives to tell the story of the journey back to health. Some institutions solicit (first-person) patient self-submissions, such as the photo-and-text essays from Dana Farber’s “What Our Patients and Families Say” series. These are usually short, patient-written submissions that just need to be proof-read and approved by the organization before added to the website. It’s a new twist on the traditional kudos letter-writing. Besides text-and-photo stories (including e-newsletters or digital publications), digital and video series, and self-submission essays, patient stories also are used for lead-ins for web pages/sections, like Duke Medicine’s “Living with One Eye,” which serves as the “hero pic” for the department’s web section. Each department page previews a patient story, and then links it to the full story on the hospital blog. Some organizations are pushing the social media boundaries and are using other platforms to communicate their stories. 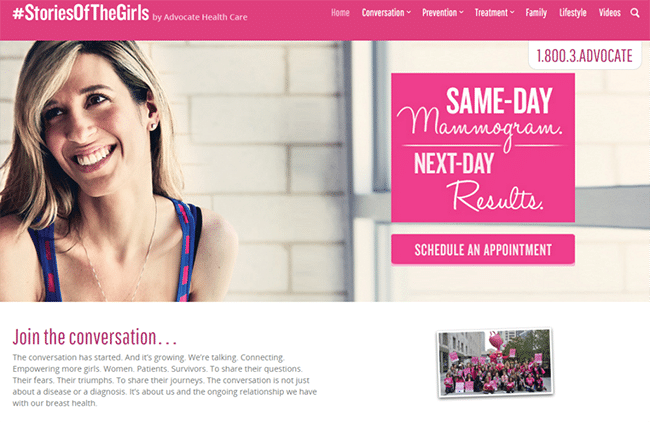 Advocate Health Care employs a hashtag campaigns to carry their advocacy message for annual mammograms and breast cancer awareness with their #StoriesOfTheGirls. The “conversation” is far-reaching with a separate website, Twitter feed, Pinterest board, etc. Advocate Health Care created a wide-reaching hashtag campaign with #StoriesOfTheGirls. Whether it’s Google+ (Mayo Clinic), Flickr (Detroit Medical Center), Instagram (John Hopkins Medicine), Tumblr (Sarasota Memorial Hospital) or the typical “Big Five” platforms, hospitals and healthcare organizations have more than one avenue to share their story. A story that usually is told through the experience of a patient, and that usually lives on the website, but is linked, liked and shared in variety of other ways.